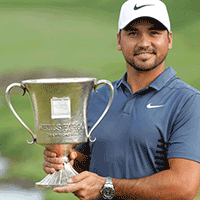 Congratulations to Jason Day on his win at the Wells Fargo Championship! The Wells Fargo Championship Cup was designed by Malcolm DeMille, and is a handmade cast bronze cup that is silver-plated with a hand carved crystal in the center featuring the Wells Fargo Championship logo. The Cup also has detailed handles bringing all the elements together to portray the rich history of the tournament. The Pro-Am participants won a Malcolm DeMille stainless steel Trophy Tray featuring a replica of the Wells Fargo Championship cup.